Today went better than we could have ever imagined! Julia is as cute and sweet as she can be. We've had a great day getting to know her. My computer doesn't want to add pictures, so I'll have to try to figure out the problem and add them to another post. Tomorrow is Julia Day! It doesn't seem real that I'm sitting in a hotel room in Shanghai and that I just typed those words. After so many months ofwaiting, we're hours away from meeting our new little daughter! This whole experience seems surreal. I mean, who hops on a plane, flies to the other side of the world, and comes home with a new child? Other people, other families. I've read about them and talked with them, but I never thought I would be one of them- until I saw those eyes. There was something strikingly familiar about those eyes. Now I understand that God placed a Julia-shaped hole in my heart that will only be filled when she is my daughter and I'm her mother. Suddenly it doesn't metter how many miles the trip, how much the cost, or how far from home this journey takes us. My daughter is away from me and I need to go get her. It's the same feeling I have when my other two are away from home. Life isn't as it should be until we're all under one roof. So here we sit, not many miles away, ot many hours away. We're going to pick up our daughter and take her home, then life will be as it should be. One week from today, we will be nervously waiting. One week from today, we will sign several papers taking guardianship of a little girl whose adoption will be completed the next day. One week from today, we will try to contain the excitement that has been building up in us as we prepared for this day. One week from today, a nanny will walk Julia into the room and bring her to us. One week from today, Julia's world will be turned upside-down. We know it's for the better; she may not. 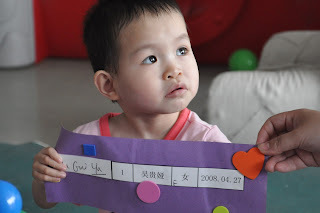 One week from today, Julia will hear the words, "Wo Ai Ni" (I love you) from her new mama and baba. One week from today, this journey that we thought we were already on will finally begin. One week from today, there will be one less orphan in the world.